Chivaho FCU appreciates your years of member loyalty and trust. We would like to say thank you by offering an additional discount on interest rates for your next vehicle or signature loan. * All you have to do is use three or more of our account services (for example - a regular saving account, checking account and a Visa credit card). Contact the Credit Union for more information on qualifying account services. 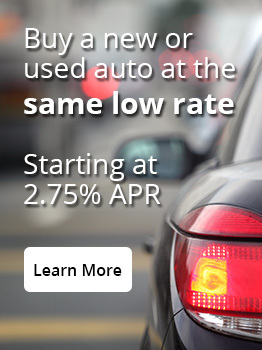 Our low cost account services + your years of membership = saving on your next vehicle or signature loan. *New money only. Total discount not to exceed 1.00%. Excludes business accounts. Chivaho FCU may amend or discontinue the program at any time without notice.